Born in 1969 in Zaporozhye, Ukraine. Graduated College of decorative and applied arts in Uzhgorod in 1988. Lives and works in Uzhgorod. 2009 Nine lives of Johnny Weismuller (V. Kharabaruk-A.Stegura), Gallery Corridor, Uzhgorod. 1996 Cut flowers (A. Stegura - V. Harabaruk), Transcarpathian Ethnographic Museum, Uzhhorod. 2018 Colorings, special project by BIRUCHIY in the framework of Kyiv Art Week, Toronto center, Kyiv, Ukraine. 2016 BIRUCHIY 016, Contemporary art project, a peninsula of Biryuchiy, Ukraine. 2015 Plakhtiy, art center "Ilko’s Gallery", Uzhgorod, Ukraine. 2014 Occupied by art, ErmilovCentre, Kharkiv, Ukraine. Did The Show Actually Happen? Another Vacant Space, Berlin, Germany. Aggression, Borderline territory, Closed Cluster #10, Kyiv, Ukraine. Valley of narcissuses, Closer, Kyiv, Ukraine. 2013 Insomniа, Ilko Gallery, Uzhgorod, Ukraine. Temporary exhibition, Korridor art-gallery, Uzhgorod, Ukraine. 50/Western Ukrainian modern art, Ljubomirsky Palace, Lviv, Ukraine. Where vines gone, Naval Museum, Sevastopol, Crimea, Ukraine. Eros’ Error, Ilko Gallery, Uzhgorod, Ukraine. 2012 Biruchiy-012, ArtKyiv Contemporary XII, Mystetsky Arsenal, Kyiv, Ukraine. Art Heat, Karas Gallery, Kyiv, Ukraine. Viva Mexico! (within the framework of the Festival of Latin-American culture "Casa Latina"), "In Spasskaya, 45" gallery, Mykolaiv, Ukraine. 2011 Relapses, Silverland Gallery, Uzhgorod, Ukraine. Variations BIRUCHIY, Institute of Contemporary Art, Kyiv, Ukraine. Love in the the Time of Plague, Amphitheatre, Uzhgorod, Ukraine. АйТуАй, PopTrans, Karas Gallery, Kyiv, Ukraine. АйТуАй, PopTrans, Dziga Gallery, Lviv, Ukraine. PopTrans, Gary Bowman gallery, Lviv, Ukraine. 2010 New Man, international symposium of contemporary art "Biruchiy 0010", Zaporizhya, Ukraine. A 4, Artists are painting, Karas Gallery, Kyiv, Ukraine. "Pipe", Festival of short videos, Uzhgorod, Ukraine. 2009 The Art Inspired By Philately, MUFI, Oaxaca, Mexico. ART-Vilnius, Artists are painting, Vilnius, Lithuania. As variant, international symposium of contemporary art "Biruchiy 009", Zaporizhya, Ukraine. 2008 Past Perfect, Korridor Gallery, Uzhgorod, Ukraine. Panic Button presentation. Brandeis University, Boston, USA. Who are you?, international symposium of contemporary art "Biruchiy 008", Zaporizhya, Ukraine. P-311008. Poptrance, Korridor Gallery, Uzhgorod, Ukraine. 2007 Happy L'end, Karas Gallery, Kyiv, Ukraine. Ex Libris d’Un Peintre, Second International Open Book Festival in Moscow, Central House of Artists, Moscow, Russia. 2006 Message in a Bottle, Stanica Centre, Zilina, Slovakia. Message in a Bottle, Galerie Nuit d’ Encre, Paris, France. 2005 West CARE, Zentrum KREUZBERG, Berlin, Germany. 2004 Ex Libris d’Un Peintre, K-Petrys haz, Budapest, Hungary. 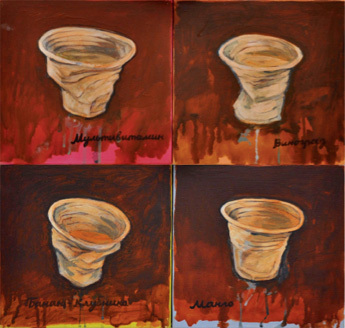 2001 "Развесёлое житиё", Universitet Gallery, Kyiv, Ukraine. 2000 Ukrajnai Ugry-Bugry, K. Bazovsky galeria, Budapest, Hungary. 1998 Trap for dreams, 1 Ukrainian Festival of Video Art, Kyiv, Ukraine. Museum and contemporary art, Transcarpathian Art Museum, Uzhgorod, Ukraine. 1996 Sofievka-200, Central Exhibition Hall, Kyiv, Ukraine. Zoo Zone, Island of Khortytsya, Zaporizhya, Ukraine. Artists of Zaporozhye, Gallery Kiyv, Kyiv, Ukraine. 1994 Fiatal Ukran Festomuveszek, TAM-TAM galeria, Budapest, Hungary. P.S., Transcarpathian Art Museum, Uzhgorod, Ukraine. Khortytsya-94 Gallery, Kiev, Kyiv, Ukraine. 1993 Ukrainian Enamel, Christina Czorpita Gallery, Philadelphia, USA. Impreza-93, the International Biennale, Ivano-Frankivsk, Ukraine. 1992 Group Exhibition, National Museum, Lviv, Ukraine.